After eating adequate Tex-Mex in San Diego, I was interested to revisit New York’s rendition. On our way to see Melissa Ferrick at the Bell House, my dining partner and I stopped at Rachel’s Taqueria in Park Slope. Its over-the-top Mexican kitsch decor turned me off at first, but the food proved to impress. We started with the fresh-made guacamole. A guacamole man rolled a cart to our table and proceeded to unwrap two avocados, sprinkle some cilantro and onions into the mortar, and smash away using two spoons. At the end, the guacamole man placed one of the avocado pits on top of the guac and inserted two chips, which were, by far, the highlight of the meal. The homemade chips are thick, substantial. We went through two baskets of them. 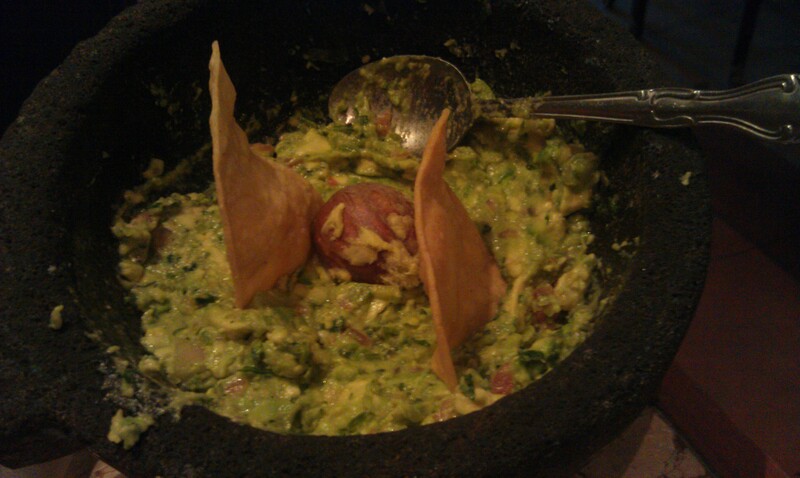 As for the guacamole, it was well-seasoned and dotted with small chunks of avocado–just the consistency I like. When we were in San Diego, we ordered guacamole and chips from El Zarape. They gave us guacamole that was near-liquid. Gross. My dining partner and I both ordered burritos. 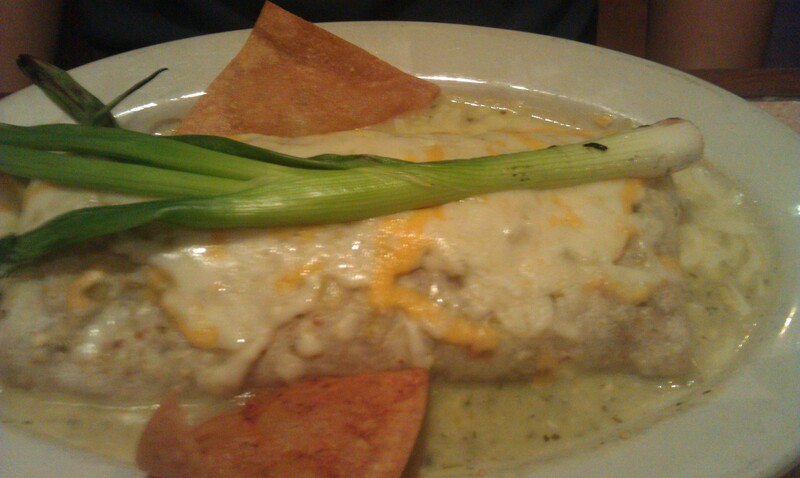 Mine was the Baja, which is a smaller version of the giant California burrito they offer. It contained shredded chicken and spinach, sour cream, guacamole, lettuce, and cheese. It was great, but I could only eat half of it. I can’t imagine what a feat it would be to finish the California burrito. My dining partner’s burrito was called El Cholo, a special, featuring carnitas, green tomatillo sauce, and cheese on top with a scallion for decoration. He ate the entire thing, so I’m thinking it was pretty delicious. We didn’t order dessert at Rachel’s, though they do offer it. In addition to our meals, we drank pink lemonade margaritas on the rock, which were only $4.50 apiece. (It was too sweet for me, but MDP enjoyed his.) Overall, Rachel’s delighted our palettes in a way that San Diego’s Tex-Mex (that we tried) never could.